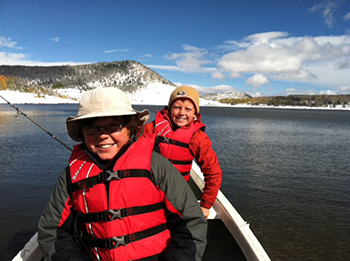 DWR's Central Region supervisor teaches his nephews the ropes. THE ANNUAL DEER HUNT has always been pretty sacred in my family. Growing up in California in the 1960s, hunting for coastal blacktail deer with my father was an every-weekend affair throughout July and August. We hunted mule deer in the Ruby Mountains in Nevada during my teenage years and he followed me to the Bear River Range while I attended Utah State. Since getting hired by the Utah Division of Wildlife Resources in 1978, our annual fall outings have taken us to the Raft River Mountains, Book Cliffs, Wasatch Plateau, Sanpitch Range, Deep Creeks, Boulder Mountains, Tabby Mountain and Currant Creek. At 90, following hip and shoulder replacement surgeries, dad finally decided that deer hunting was a bit too risky. What he didn’t realize was that even though he wouldn’t be making the annual trip personally, his role would be no less important to keeping the family tradition alive. I loved seeing my nephews thrive in an environment far different from the streets of Berkeley. It just so happens that my brother has been grooming his three sons to fill in the void left by my dad’s absence. Joshua, Isaiah and Elijah (12, 10 and 8 respectively) have been hiking the hills above Berkeley, California since they could walk, and spotting deer has become a favorite pastime. Joshua has been flying out by himself to join me at deer camp for the past three years, and this year, he and Isaiah showed up at the airport, anxious to get out on the muzzleloader deer hunt. The North Slope Deer Unit may not have the best deer hunting in the state, but the experience can be very rewarding if you’re willing to sacrifice a little success for beautiful country and some solitude. 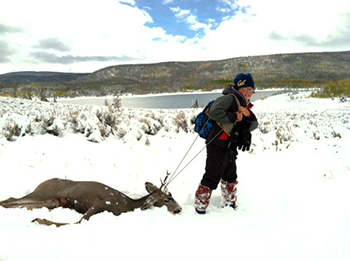 The weather forecast called for snow at the higher elevations during the hunt, so there was a good chance that deer would be moving through the area on their way to winter range throughout the week. The boys were excited for the hunt, but equally excited about the fishing that would take place in the nearby lake as we rolled into the Forest Service campground and selected a spot to park the trailer. The snow hit on Thursday evening and lasted most of the night; by morning it had piled up about 10 inches. Breakfast was served pretty late and we didn’t get out of the trailer until 10:00 (I could sense dad’s disgust from 800 miles away). I decided to hunt an area affectionately referred to as “The Honey Hole” by some of my coworkers who have been hunting the area for years. I introduced the kids to one of my dad’s special tricks for hauling muleys off the mountain. A break in the storm gave us an excellent opportunity to find a spot among the mature stand of Douglas fir and aspen and just sit and see what might be moving around. I broke out my foldable tripod chair and the boys plopped down in the snow to wait/freeze (I promised to get them chairs for next year). We weren’t there more than 15 minutes when a doe started working its way toward us. Behind the doe was another deer, but I couldn’t tell what it was. At 30 yards, standing broadside, I could barely see the antlers until it moved its ears out of the way. For me, if the standard for harvest on day one is a four-pointer and it drops to a three-pointer on day two, then most bucks become vulnerable on day three. It didn’t take me long to decide what was going to happen. I had two future deer hunters freezing in the snow behind me, the shot was ideal, the drag would be an easy one downhill to the truck and they would learn all the rituals dad passed on to me about taking care of the animal. Joshua put his hands over his ears and motioned to Isaiah to do the same as I set the hair trigger on my 50-caliber muzzleloader. Within seconds after the smoke cleared, the animal stopped running and it was over. The boys were beside themselves. The look on their faces was one of excitement and sheer joy. For a brief moment, they weren’t concerned about their frozen toes. After a round of high fives, I showed them how to properly notch the tag and field dress the animal. Then I introduced them to one of dad’s special tricks. I attached the dragline that he invented years ago to haul big muleys off the top of the Ruby Mountains. It consists of a strip of canvas 6” by 4-5’ with wood dowels (1”x6”) rolled into each end with a 10’ length of a nylon rope connected to each dowel. 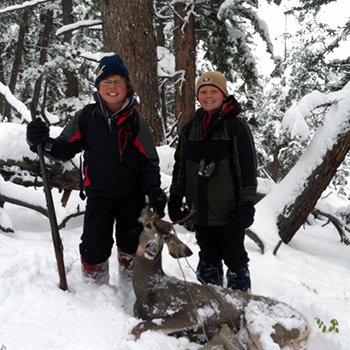 The rope is attached to the antlers, the strap is draped over your shoulder and “off you go.” The boys took turns hauling the buck off the mountain. Once we were back at our camp, I grabbed the box with all of dad’s stuff for taking care of the deer. Hunters had already lashed a sturdy branch between two trees at our campsite, so all we needed to do was get out dad’s gambrel and hoist. Once up off the ground, we removed the hide, trimmed away all damaged meat and coagulated blood, trimmed away anything remaining in the body cavity. Last but not least, we removed the bladder without incident (many years of observing the “master” were required to get this right). After the hunt, we fished — and it was great. Continuing with the process long established by my father, we washed the deer inside and out with a super-saturated salt solution. Not only does the solution remove impurities that could taint the meat (stomach contents, etc. ), it leaves salt on the surface that serves as a preservative. It was so cold, I didn’t bother to put the game bag on until that evening. The fishing was great. I got to see my nephews thrive in an environment far different from the streets of Berkeley. It was good for them. It was good for me. When my dad decided to quit coming out for the deer hunt, I wondered what it would be like to head out to the woods without him. It’s different, but in many ways he’s still there, and he has sent out some pretty great grandkids to take his place. The only requirement is that he gets a full report upon their return. The Fairchild Family hunting tradition is alive and well. << (Previous) Ready, aim, take ’em! that is what it is all about! great story! Hope you have many more hunts with your family! Keep the tradition alive! Hi John, this was a fun story to read, and I’m sure there are many family in Utah and across the country who share your passion, and the family bond the tradition creates. Great article…I am already excited for next year’s hunt! This is Nancy larmour from Berkeley High. Was trying to catch up with old friends and when I searched for you this article came up. Nice to see your following your passions and doing so well. Give Meg my best.